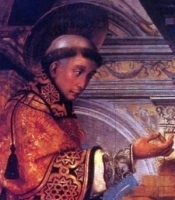 Born to the nobility, Alphonsus was a child prodigy; he became extremely well-educated, and received his doctorate in law from the University of Naples at age 16. He had his own legal practice by age 21, and was soon one of the leading lawyers in Naples, though he never attended court without having attended Mass first. He loved music, could play the harpsichord, and often attended the opera, though he frequently listened without bothering to watch the over-done staging. As he matured and learned more and more of the world, he liked it less and less, and finally felt a call to religious life. He declined an arranged marriage, studied theology, and was ordained at age 29. Preacher and home missioner around Naples. Noted for his simple, clear, direct style of preaching, and his gentle, understanding way in the confessional. Writer on asceticism, theology, and history; master theologian. He was often opposed by Church officials for a perceived laxity toward sinners, and by government officials who opposed anything religious. Founded the Redemptoristines women's order in Scala in 1730. Founded the Congregation of the Most Holy Redeemer (Liguorians; Redemptorists) at Scala, Italy in 1732. Appointed bishop of the diocese of Sant'Agata de' Goti, Italy by Pope Clement XIII in 1762. Worked to reform the clergy and revitalize the faithful in a diocese with a bad reputation. He was afflicted with severe rheumatism, and often could barely move or raise his chin from his chest. In 1775 he resigned his see due to ill health, and went into what he thought would be a prayerful retirement. In 1777 the royal government threatened to disband his Redemptorists, claiming that they were covertly carrying on the work of the Jesuits, who had been suppressed in 1773. Calling on his knowledge of the Congregation, his background in thelogy, and his skills as a lawyer, Alphonsus defended the Redemptorists so well that they obtained the king's approval. 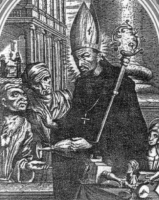 However, by this point Alphonsus was nearly blind, and was tricked into giving his approval to a revised Rule for the Congregation, one that suited the king and the anti-clerical government. When Pope Pius VI saw the changes, he condemned it, and removed Alphonsus from his position as leader of the Order. This caused Alphonsus a crisis in confidence and faith that took years to overcome. However, by the time of his death he had returned to faith and peace. Alphonsus vowed early to never to waste a moment of his life, and he lived that way for over 90 years. Declared a Doctor of the Church by Pope Pius IX in 1871. When he was bishop, one of Alphonsus's priests led a worldly life, and resisted all attempts to change. He was summoned to Alphonsus, and at the entrance to the bishop's study he found a large crucifix laid on the threshold. When the priest hesitated to step in, Alphonsus quietly said, "Come along, and be sure to trample it underfoot. It would not be the first time you have placed Our Lord beneath your feet." The feast was originally kept in Rome, Italy to commemorate the dedication of the Church of Saint Peter on the Esquiline Hill built by Eudoxia Licinia in 442, and rebuilt by Adrian I in the 8th century. When the chains which Saint Peter had worn in prison, and from which he was freed by angelic intervention (see readings below) were later venerated there, the feast received its present name. The date when these chains were brought from Jerusalem is disputed; some claim they were brought in 116 by travellers sent in search of them by Saint Balbina and her father Saint Quirinus, while others think Saint Eudoxia brought them in 439. Pope Saint Leo the Great united them to the chains with which Saint Peter had been fettered in the Mamertine Prison, forming a chain about two yards long which is preserved in a bronze safe and guarded by a special confraternity. About that time King Herod laid hands upon some members of the church to harm them. He had James, the brother of John, killed by the sword, and when he saw that this was pleasing to the Jews he proceeded to arrest Peter also. (It was [the] feast of Unleavened Bread.) He had him taken into custody and put in prison under the guard of four squads of four soldiers each. He intended to bring him before the people after Passover. Peter thus was being kept in prison, but prayer by the church was fervently being made to God on his behalf. On the very night before Herod was to bring him to trial, Peter, secured by double chains, was sleeping between two soldiers, while outside the door guards kept watch on the prison. Suddenly the angel of the Lord stood by him and a light shone in the cell. He tapped Peter on the side and awakened him, saying, "Get up quickly." The chains fell from his wrists. The angel said to him, "Put on your belt and your sandals." He did so. Then he said to him, "Put on your cloak and follow me." So he followed him out, not realizing that what was happening through the angel was real; he thought he was seeing a vision. They passed the first guard, then the second, and came to the iron gate leading out to the city, which opened for them by itself. They emerged and made their way down an alley, and suddenly the angel left him. 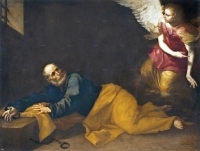 Then Peter recovered his senses and said, "Now I know for certain that [the] Lord sent his angel and rescued me from the hand of Herod and from all that the Jewish people had been expecting." When he realized this, he went to the house of Mary, the mother of John who is called Mark, where there were many people gathered in prayer. When he knocked on the gateway door, a maid named Rhoda came to answer it. She was so overjoyed when she recognized Peter's voice that, instead of opening the gate, she ran in and announced that Peter was standing at the gate. They told her, "You are out of your mind," but she insisted that it was so. But they kept saying, "It is his angel." But Peter continued to knock, and when they opened it, they saw him and were astounded. Born to a working class French family living in Algeria. At age 10, Pierre joined the scouts in a troop led by Dominicans, and became familiar with their spirituality. He attended college in Grenoble, France, and joined the Dominicans himself at the convent in Lille, France on 7 December 1958. He studied at a Dominican institute near Paris, France, and in 1962, after the Algerian war of independence, he returned to Algiers. There he served his mandatory time in the armed forces, but refused to bear arms. After his service, Pierre resumed his studies in France in September 1963, and was ordained a priest on 4 July 1965. Father Pierre spent time learning Arabic and studying Islam, then returned to Algeria to help the people re-build their lives after the war. From 1973 to 1981 he ran an institute in Algiers for the study of classical Arabic and Islamic history; it was started as a way to prepare Christian missionaries for work in Islamic regions, but became a popular school for local Muslims who wanted to learn Arabic and their Islamic cultural history. Father Pierre worked for dialogue between Christians and Muslims, believing that communication and open religious discussion could lead to peace. He was chosen bishop of Oran, Algeria on 25 May 1981. He built libraries, therapy centers for the handicapped, and schools, including ones for women. When the Algerian Civil War broke out in 1992, many of the Catholic clergy fled the country, but Father Pierre considered himself an Algerian as well as French, and stayed to work for peace and serve his flock. He died with his driver and friend Mohamed Bouchikhi in a bomb blast set by anti–Christian forces. Martyr. Jewish dynasty which began with the rebellion of Mathathias and his five sons against the Syrian king, Antiochus IV (168 BC) and ruled the fortunes of Israel until the advent of Herod the Great. Syrian attempts to force Greek paganism on the Jews, the profanation of the Temple at Jerusalem, and the massacre which followed, brought the nation to arms under Mathathias, a priest of the sons of Joarib. At the death of Mathathias, Judas Machabeus, his third son, drove the Syrians and Hellenists out of Jerusalem, rededicated the Temple, and began an offensive and defensive alliance with the Romans. Before the treaty was concluded, however, Judas, with 800 men, risked battle at Laisa with an overwhelming army of Syrians under Bacchides, and was slain. 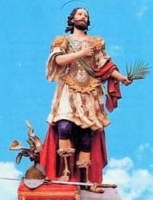 He was succeeded in command by his youngest brother, Jonathan (161 BC). Jonathan defeated Bacchides, revenged the death of his brother, and made peace with Alexander who had usurped the throne of Demetrius, the successor to Antiochus. A period of peace followed in which Jonathan ruled as high priest in Jerusalem, but Tryphon, who was plotting for the throne of Asia, treacherously captured him at ptolemais and later put him to death. The captaincy of the armies of Israel then fell to Simon, the second son of Mathathias. Under him the land of Juda flourished exceedingly. He obtained the complete independence of the country and a grateful people bestowed upon him the hereditary kingship of the nation. His rule marked five years of uninterrupted peace. He was treacherously slain by his son-in-law, Ptolemy, about the year 135 BC After Simon the race of the Machabees quickly degenerated. In 63 BC the Romans thought it necessary to interfere in the fratricidal war between Hyrcanus II and Aristobulus II. With this interference and the advent of Herod the Great the scepter passed forever from the land of Juda. The story of the Machabees is written in the two books of the Old Testament which bear that name. Born to a farm family, he was a shepherd in his youth. Taught catechism to other children. Entered Saint-Barbe College, Paris, France in 1525. Friend of Saint Francis Xavier and Saint Ignatius Loyola. Ordained in 1534. Joined Ignatius' early band of Jesuits on 15 August 1534. Assisted at the Diet of Worms in 1540. Assisted at the Diet of Ratisbon in 1541. Preached in Parma, Speyer, Mainz, Cologne, Savoy, Portugal, Lisbon and Valladolid, revitalizing the laity, reforming the clergy and opposing Lutheranism. Helped Saint Peter Canisius realize his vocation. Worked with Saint Francis Borgia. The pope planned to send him to the Council of Trent as theologian of the Holy See, and Pope John III wanted him to be the Patriarch of Ethiopia, but his health failed and he could not take either of these responsibilities. Had a great devotion to the angels. The diary of his travels and work has survived. A princess, the daughter of King Brychan. A pious girl, she made a private vow of chastity, and dedicated her life to Jesus. When her family tried to force her into an arranged marriage for political reasons, she fled her father's kingdom. Fearing Brychan's revenge if they helped her, villages turned her away. At Brecon she acquired a small hut, and lived there briefly as a prayerful hermitess. However, Brychan found her and demanded that she return home to be married. When she refused, standing by her vows, he killed her. Legend says that a healing spring of water appeared at the site of her death, and that the villages that had turned her away were beset with disasters. She is the Luned of the Mabinogion and the Lynette of Tennyson's Gareth and Lynette. Priest in the archdiocese of Münster, Germany, ordained in 1932. Member of the Schoenstatt Movement. For preaching against Nazism, he was arrested by the Gestapo and shipped to the Dachau concentration camp on 15 December 1941. Martyred by the Nazis. Brother of Blessed Lucy Bufalari. Augustinian friar-hermit at Rieti, Italy. Loved to serve at Mass. Friary porter, caring for travellers and the poor. The daughters of Saint Sophia. While still children, they were tortured and martyred for their faith in the persecutions of Hadrian. Dominican priest. One of the Martyrs of Vietnam. Lay-brother in the Vallombrosan Order. Noted exorcist. Legendary mother of the virgin martyrs Faith, Hope, and Charity. Three days after the death of the daughters, Sophia passed peacefully away while praying by their tomb. As her name means wisdom, and her offspring are named for virtues, some writers believer she is a personification of an allegory. Hermit on the island of Vindomitte, France. Friend of Saint Secundel. When tormented for his piety, a cloud of wasps attacked his tormenters; when Friard prayed for them, the wasps left. Missionary. Martyred in the persecutions of Maximian Herculeus and Prefect Dacianus. The Christian poet Prudentius wrote in his honour. Celtic monk. Pilgrim to the Holy Lands. On his return, he spent the rest of his life as a hermit in the Apennines near Modena, Italy where he was known by the locals for his sanctity. Priest. Martyred with eleven others. The town of San Buono, Italy is named for him. An indulgence which may be gained in any church so designated by the bishop, by all the faithful who after Confession and Holy Communion, visit such churches between noon of 1 August and midnight of 2 August, or on the Sunday following. The indulgence is toties quoties and is applicable to the souls in Purgatory. Bishop of Palestrina, Italy. Martyred in the persecutions of Diocletian. Fourth century bishop of Bayeux, France. Martyred with several companions by order of Flavian for destroying the altar of a pagan goddess during the persecutions of Diocletian. Martyred during the persecutions of Diocletian with several companions by order of Flavian for destroying the altar of a pagan goddess. Vallombrosan monk. Spiritual student of Saint John Gualbert. Abbot general. Nephew of Saint Patrick who consecrated him as a travelling, missionary bishop. Worn from his travels, he retired to live as a monk and then abbot of the monastery Inishboffin, Ireland. Son of a 6th century chieftain. Hermit on the peninsula of Gower, Wales, a place later known as Llangenydd in his honour. Benedictine monk at Elnone, Belgium. Spiritual student of Saint Amandus of Maastricht. 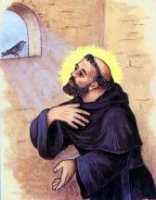 Abbot at Saint Machiennes c.643-652. Abbot at Elnone c.652-659. Bishop of Bourges, France. Attended the Council of Orléans in 538. Bishop of Vienne, Gaul (modern France). Attended the Synod of Arles in 314. Hermit on the island of Vindomitte, France. Friend of Saint Friard. Layman. Martyred with eleven others. A group of six Christians martyred. No information about them has survived but the names - Aquila, Cyril, Domitian, Menander, Peter and Rufus.